Universidad Austral’s new graduate program focuses on an unsolved issue in Argentina. News article published by La Nación newspaper on Monday, December 12, 2016. “Argentina is currently challenged to professionalize public service,” says Celina Cantú, head of the M.A. in Public Policies, a new graduate program to be offered by Universidad Austral next year. This program has been designed for current and future public officials as well as for professionals working in the private sector who have ties with government agencies. With a predominantly practical approach, the goal of this program is quite specific: training professionals for the challenges that characterize public service. 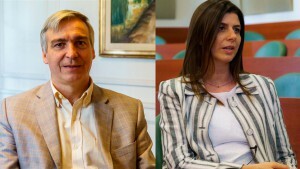 The principals at Universidad Austral’s School of Politics, Government and International Relations have been working on this program’s contents for two years, visiting three renowned schools around the world –Harvard Kennedy School in the United States, the London School of Economics and Political Science, and Paris’ Sciences Po. This program launching comes at a time in Argentina when public service issues once again capture the spotlight. “The country needs public servants who, first of all, have a clear long-term vision. They also need the adequate tools to size up the problems at hand, and, finally, they must operate in such a way that the State, players and society at large support the pursuit of a number of goals,” explains Cantú, who hold a B.A. in Public Administration and Political Science, as well as a Master’s degree in Social Research Methodologies from the London School of Economics and Political Science, and a faculty member at Universidad Austral for the past 18 years. Organized in a theoretical first a year and a second orientation year, UA’s Master in Public Policies relies on a practical approach based on a case study lab that the faculty has been preparing for two years, and a final workshop to work on a specific public policy. “We have researched 40 cases of specific government experiences that can provide relevant takeaways for our students,” elaborates Alfonso Santiago, head of Universidad Austral’s School of Politics, Government and International Relations. Buenos Aires City’s Metrobus project, the public transit SUBE card, electronic voting, and San Juan Province’s mining and environmental policy issues have been but a few of the specific public policies explored by the program’s team to enrich its classes. The final assignment to qualify for the M.A. in Public Policies will follow a similar rationale: supported by a workshop with tutors, program participants will have to choose a current domestic issue and formulate a proposal for a solution as a first exercise with actual problems. Universidad Austral’s Master in Public Policies starts in April 2017, with classes every other Friday, on a full-time schedule, at UA’s Buenos Aires City downtown campus ­–Cerrito 1250– and on Saturday mornings at its Pilar Campus. The first year focuses on the design, execution and assessment of public policies. The goal at this point is for students to acquire the knowledge, skills and tools required to manage a public policy from the very beginning, bearing in mind the setting and the stakeholders at play at all times. The second year offers an open syllabus –that is, participants can follow the program’s specific curriculum or take subjects from other graduate programs, both at Universidad Austral and other universities. In addition to the Master in Public Policies Program, Universidad Austral’s School of Politics, Government and International Relations currently offers two undergraduate programs in Political Science and International Relations, as well as several training programs. Universidad Austral, presently celebrating its 25th anniversary, delivers its 13 undergraduate and 48 graduate programs to some 6,000 students. Internationally, it ranks as the first private university in Argentina and the second one overall, behind Universidad de Buenos Aires.